It’s been available to buy for a couple of months now, but getting your hands on a new iPhone 5s still isn’t the easiest thing in the world. Things are starting to get better though, as Piper Jaffray analyst Gene Munster points out while pointing at a nice colorful graph that backs up his claim. It’s a shame it’s not the same graph that says when the Apple television well be released, eh Gene? Thankfully this research seems much more accurate than the yearly guess as to when an Apple-made television will be announced, with Munster collating information from 60 US-based Stores in order to come to the conclusion that the iPhone 5s is currently showing at 90% availability, not including the unlocked SIM-free iPhone 5s that only recently went on sale in the country. According to the stats, that 90% availability is up from just 31% two weeks ago and only 10% a couple of weeks post-iPhone release in early October. 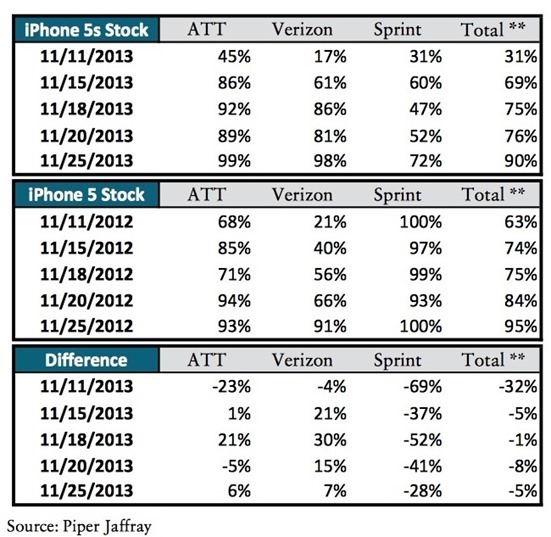 Using Munster’s graphs and tables we can see that in fact stock of both Verizon and AT&T iPhones is nudging the 100% mark, with the ability to walk into a store and then walk out with your choice of iPhone 5s not that far away. Unfortunately, it’s stock of the less popular Sprint option that is pulling the total availability percentage down. 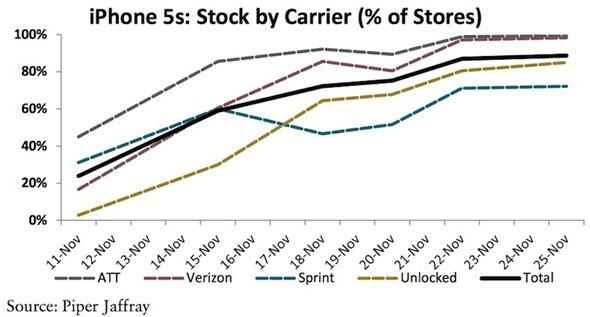 This is possibly due to the fact that Apple is pushing stock to the more popular carriers, leaving Sprint lagging behind. Total available iPhone 5s SKUs (excluding unlocked) have increased to 90% from 31% two weeks ago, and 10% at the beginning of October. Separately, we note that the lightest stocked store we checked had 67% of available SKUs. The Piper Jaffray analyst then goes on to say that his firm expected Apple to reach that magical supply-demand equilibrium as soon as early December. If you’re still on the lookout for an iPhone 5s in the color of your choice, hopefully you won’t have to wait much longer. 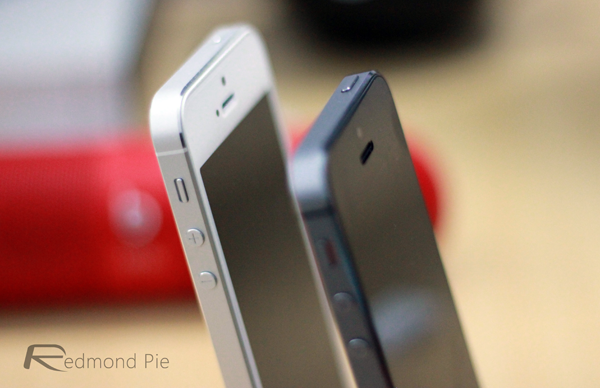 Apple released the iPhone 5s alongside the iPhone 5c in late September. Stock was immediately depleted with the gold variety almost impossible to get hold of internationally, with report of stores receiving an initial allocation of gold iPhones in the single digits. With the news that stock constraints are beginning to ease, we’ll just sit back and wait for the next big product launch out of Cupertino so that we can start all over again!